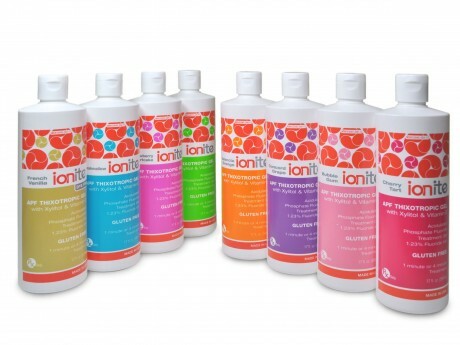 Ionite APF is a 60 second acidulated phosphate fluoride gel. It is a very reliable thixotropic gel as it flows easily during tray placement and its thick pudding consistency minimizes the risk of ingestion and assures maximum contact with all tooth surfaces. Its acidic PH between 3 and 4 enhances fluoride uptake in 60 seconds. Its specially formulate flavors prevent bitter aftertaste and give patients a pleasant taste. • Xylitol: this is an ideal ingredient for caries prevention. This ingredient is specific in its inhibition of the mutans streptococci group, bacteria that are significant contributors to tooth decay. It is safe for diabetics and individuals with hyperglycemia. • Vitamin E: this ingredient provides beneficial antioxidant effects and serves as a natural desensitizing agent.